Preheat oven to 425°F. Spread Ranch dressing on partially baked crust. Sprinkle mozzarella and Monterey Jack evenly over dressing. Sprinkle herbs evenly over cheese. 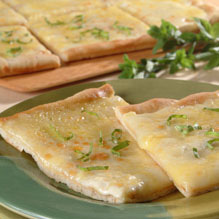 Bake about 15 minutes, or until cheese is melted and bubbly and the crust is crisp and golden.Variations:Western WhiteRicotta is a fresh Italian-style cheese that gives this pizza a slightly sweet and creamy texture. Mix 1 cup ricotta with oregano, basil and salt and pepper to taste. Spread the seasoned ricotta over Ranch dressing. Add ½ cup diced onion and sprinkle mozzarella and Monterey Jack over all.Western Green and WhiteFor a more adventurous version of the classic white pizza, sprinkle 1 cup chopped fresh spinach and 1 cup cooked chicken (shredded or cubed) over Ranch dressing. Sprinkle mozzarella, Monterey Jack and herbs over all.